UK doctors fear public safety could be compromised by the growing interest of world governments in using drugs for law enforcement. 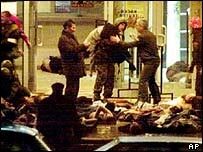 A report by the British Medical Association points to the example of the Moscow theatre siege of October 2002 where over 120 hostages died. The Russian authorities had used a drug delivered through the air-conditioning system to end the siege. Medics argue the innocent are inevitably harmed alongside criminals. It is impossible to deliver the right drug in the right dose to the right individuals in a way that is both effective and does not cause significant deaths, the BMA's Board of Science concludes. The anaesthetic drug used in Moscow killed one in six of those present in the theatre. It warns that using powerful drugs in this way may constitute a violation of international conventions which prohibit the use of chemical weapons. And future advances in drug development may spawn more sophisticated and sinister agents, it says. Dr Vivienne Nathanson, head of science and ethics at the BMA, said their concern surrounded drugs that could poison and kill at the wrong dose, rather than less harmful agents used for riot control such as tear gas. She explained: "It is disingenuous of governments to describe drugs as non-lethal - there is no difference between a drug and a poison except the dose. "It is virtually impossible to control the amount of a drug delivered or to ensure it acts without producing toxic effects or causing death." She said doctors needed to be aware that their medical knowledge might be called upon for the development of drugs for military purposes, as well as antidotes and treatments. She urged medics to advocate against the use of drugs for law enforcement and not be involved in the training of military or law enforcement personnel in the administration of drugs as weapons. According to the report, some experts in some countries, including America and China, are pushing for legislation to allow the use of chemical weapons beyond the current narrow definition of riot control. Dr Nathanson said: "It is absolutely essential that we do not allow an extension of the use of chemical weapons or a re-writing of the law that bans them. If we do, that will put all of us at risk." Moscow theatre siege: Was the right action taken?